We’ve all been there, you come home from work and the first thing you smell when you walk into your house is the smell of a dirty litter box. Sound familiar? You wouldn’t be alone us cat owners all experience this and sometimes you just can’t be bothered to change cat litter as it’s one of them jobs that we all like to “put off” but we’ve got to do it as a responsible pet owner. What if there was a way round this? well, there is in the form of a self cleaning litter box! In this article, I’m going to review both manual and automatic self cleaning litter boxes and look at the pros and cons and which is the best value and most efficient litter box on the market. A self cleaning litter box is exactly what the title suggests, it’s a mechanical system that clears the large clumps from the litter and typically moves these into a box or bag ready for disposal. There are many different kinds of self cleaning litter boxes, some are fully automatic and typically have a rake that sifts through the litter and removes the waste into a tray. They have motion sensors to detect if your cat is in the litter tray and generally don’t operate for around 20 minutes after your cat has used the litter box. Some automatic litter boxes have a rotating drum like the Litter Robot which then filters the waste into a chamber underneath. Do You Need a Self Cleaning Litter Box? Do you work long hours or spend a lengthy amount of time away from home? Do you HATE cleaning cat litter? If you answered yes to any of the above then a self cleaning litter box will more than likely revolutionise your home and provide you with a more hygienic place to live. Let’s face it, cleaning a litter box out by hand isn’t difficult but it isn’t pleasant either, it’s something that you sign up for when you buy a cat and most of us don’t know any different. You just get “used” to doing it. I think one of the main benefits of a automatic litter box is the time it saves you, especially with today’s hectic society we’re all too busy rushing around to take care of the small things. The hygiene element is very important, the longer the faeces stay in the box the more germs that can be spread around your house by your cat​. This is where an automatic litter box comes in by removing the faeces and keeping your litter box in a more hygienic state. Fully Automatic or Manual Litter Box? There are two different kinds of self cleaning litter boxes available on the market, these are fully automatic and manual versions. First, we’ll look at the fully automatic version and weigh up the pros and cons. Most automatic litter boxes require very little user attention other than plugging them in and assuring there’s enough litter in the tray. An automatic litter box will in general use much less litter than a conventional litter box. An automatic litter box will usually be powered by electricity or battery operated and will typically have a rake that clears the waste from the litter box. The Litter Robot works differently by using a drum which rotates and the waste is then sifted into a tray under the drum. Automatic litter boxes have special motion sensors to detect whether or not your cat is in the litter tray before they clean it. Usually, the rake or drum won’t start cleaning for at least 20 minutes after your cat has used the tray. It’s important to note that most self cleaning automatic litter boxes will require some form of power supply, normally via mains electricity. This is something worth considering before you purchase a new automatic litter box. Cats can often be quite picky when it comes to their litter and litter boxes so it can take a while for a cat to get used to their new litter box. This is entirely dependant on your cat some will take to the new litter box quickly and others might take a while longer. My own cats adapted instantly to their new litter boxes and I’ve had no issues since. The main difference with a manual litter box (not to be confused with a standard tray that you need to scoop out) is that you’re required to get more “hands on” often you will need to rotate the litter box or initiate the cleaning process. If you think of these self cleaning litter boxes as being semi automatic, having no power to operate them. It’s worth noting they’re much more automated than a standard litter tray. A manual litter box will generally use less litter than a normal litter tray but won’t use as little as a fully automatic option. Something that’s often overlooked with a manual litter box is the fact they’re easy to move around the house as they don’t require a mains power point. ​Manual litter boxes can be a great cheaper option than their fully automatic counterparts if your budget doesn’t quite stretch to a fully automatic version a manual version can be a great cheaper option. As with anything your purchase it’s very important to do your research to ensure you’re buying a product that fits your needs. The whole purpose of this post is to help you make an informed buying decision. Budget– Ultimately your budget will determine which automatic litter box you choose as there’s a vast difference between some litter boxes. Number of cats– If you have more than one cat certain litter boxes will be more suited to your needs than single cat households. Size– How much space do you have in your house or apartment? Some litter boxes are larger than others and some are slightly odd shaped so these don’t bode well if you have a small apartment or have very limited space. Ongoing Costs– Some self cleaning litter boxes will require you to buy litter refill trays or some form of waste disposal unit. This is obviously something you need to consider. Maintenance – How easy is the self cleaning litter box to maintain? does it require you to clean the rakes out every once in a while? How much litter will it require? Usability– Is the litter box easy and straightforward to use for you and your cat? we all know how fussy cats can be and some just don’t like change. If you have a 15- year-old cat that’s always used a traditional litter tray then getting him/her to use a self cleaning litter box could be more of a challenge (that’s not to say it will be though). I’m going to look at the best self cleaning litter boxes and review them in detail below to help you make that all important decision. ​You may have heard the hype regarding the Litter Robot III Open Air and in my opinion, its warranted as this is definitely the best self cleaning litter box on the market today. The Litter Robot is a truly automatic system and the most automated litter box on the market. ​At first glance, it does look like something from out of space but when you look at the design you realise that it’s shaped in a perfect way to allow your cat sufficient access. This litter box is the best on the market for multi-cat households and cats of all sizes. ​The litter robot III open air has sensors which know when your cat has been and used the litter and it won’t start the cleaning process until your cat has left the litter box. If your cat enters the litter box whilst cleaning is taking place the litter robot will automatically stop the cleaning cycle. ​The cleaning process is unique and effective, the drum part of the litter robot rotates once your cat has left the drum and sifts the clumps of litter from the clean litter and filters the clumps into a draw which has a carbon filter for ultimate hygiene. ​There is a timer on the litter box for 3, 7, or 15 minutes after your cat has finished and left the litter box to start the cleaning process. The waste drawer also contains a blue light indicator which flashes when the drawer is full. The litter robot has one of the largest waste draws on the market making it perfect for multiple cats. ​There’s a feature to lock the controls to stop children and curious pets from altering any settings. ​Most of the reviews I’ve found online all seem to paint the litter robot as being the perfect solution and don’t really cover any downsides. Obviously, no product is perfect and the litter robot does have some downsides, in my opinion, one of the main downsides would be the size of the product and the fact that it does require a mains electric connection. Not an issue in most instances but you do need to factor in the small amount of electricity it may use. ​It does carry a fairly large price tag as well, although when you factor in that you will use less litter and it will save you time it does (sort of) justify this. ​Overall a brilliant product that is currently the market leader by a considerable distance. It will save you a lot of time, effort and keep your house from having that “cat litter” smell. ​The litter robot comes with an 18-month warranty and a 90-day money back guarantee for peace of mind or if you have any problems. The PetSafe ScoopFree Ultra is one of the most popular self cleaning litter boxes on the market, in my opinion, it is the best value self cleaning automatic litter box currently on sale. ​Aimed at 1-2 cat households this self cleaning litter box simply works by raking the clumps of litter into a covered trap. There’s nothing too technical or sophisticated about the whole set up. The key to its success is due to the special absorbing litter that’s provided in the replacement trays. The crystal litter is said to absorb odour up to 5 times more effective than traditional clay based litter. These trays typically last up to 30 days according to PetSafe, however looking at the reviews online some people did suggest changing them weekly. The system works automatically and rakes the waste into a separate covered compartment typically 20 minutes after a cat has been and used the litter box. The litter box uses sensors which will automatically reset the rake system timer should a cat re-enter the box.​ The rake delay timer can be set to 5, 10 or 20 minute intervals after your cat uses the litter box (this feature is exclusive to the “ultra” version). The ultra version also has an health counter to track how often your cat uses the litter box. ​On the ScoopFree Ultra version you also get a privacy hood for your cat, which provides extra security if your cat is used to a hooded litter box. There are a few downsides to this litter box, as with the Litter Robot it is electrically operated so will require a mains plug nearby which isn’t always available in some bathrooms as I know quite a lot of cat owners keep their litter trays in a bathroom or closet. The other main downside I see is with the actual trays, these may last a few weeks at most and they are fairly expensive to buy so you will have the ongoing cost to replace these. Although the initial purchase price is very reasonable the ongoing costs could be quite high. Just something to factor in before purchasing the litter box. In some of the reviews, I’ve seen people suggest a workaround to buying the trays. You can buy a plastic reusable litter tray that fits under the litter box just like the cardboard PetSafe versions but this is a plastic box so you would empty the crystals out and reuse the box, therefore, you would only be buying the crystals which works out much more cost-efficient than buying the PetSafe replacement trays. 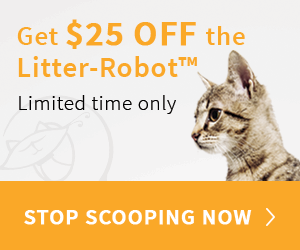 ​Overall a brilliant cheaper alternative to the Litter Robot that will essentially do a similar job. ​The Pet Zone Smart Scoop automatic litter box is a well built, robust unit. This litter box works by raking out waste and disposing of it into a carbon filtered compartment, ensuring all odours are efficiently kept away from your home. ​Boasting a very powerful yet quiet motor the Pet Zone Smart Scoop automatic litter box will clear any clumps and particles of litter very effectively due to its stainless steel rake. Some automatic litter boxes feature plastic rakes which tend to break easily and have a tendency to gather the clumps of litter rather than disposing of them. ​The motorised rake has built in sensors to detect when your cat has left the litter box. The cleaning process will start 15 minutes after your cat has used the litter box. ​One of the aspects of this automatic litter box that impresses me is the fact that the litter is scooped into a bag which you can easily dispose of, unlike some automatic litter boxes which require you to buy expensive trays. This litter box is a genuine investment and requires very little in terms of ongoing costs. ​The litter box is easy to detach and empty the tray if needed. As with most automatic litter trays, the Pet Zone Smart Scoop works best with clumping litter. ​Overall a fantastic product at a great price that’s very effective at what it does. Not many downsides to mention other than the fact it requires a mains electricity connection (same with all fully automatic litter trays). I did see some reviews saying that they had a few issues with the motor and some parts of it that were plastic and had failed, however, Pet Zone offer a 12-month warranty on this item so this wouldn’t put me off this product. If you’ve looked online for automatic self cleaning litter boxes you must have come across the CatGenie. It’s instantly recognisable due to the fact it looks not too dissimilar to a regular human toilet! The unique feature that the CatGenie self-washing litter box has is the fact it uses water not only to clean the litter but to clean that actual box itself. The good thing with the CatGenie is the waste is flushed out like a normal toilet, so you never need to handle any bags of waste or change any boxes as with other boxes. The litter box has the ability to schedule a cleaning cycle so you can do this in the night or whenever you prefer which is useful. The CatGenie uses washable litter that doesn’t need replacing like normal clumping litter or crystals, however, you will need to top the litter up from time to time. ​In theory, this is a great product and truly unique in the technology it uses but I think in some respects it’s main features are also its main weaknesses. The fact you need to plumb this in so to speak is a problem, in my opinion. You need a cold water pipe and a waste pipe, so this will need to be in your bathroom and some people just won’t have space for such a unit. Although a lot of people say the process of setting the system up and hooking it up to the cold water feed isn’t very difficult I do see problems if for example, you live in a rented property where messing with the plumbing of a house prohibited then you could come unstuck. People noted it wasn’t as effective as in terms or removing odour and the litter did tend to smell after a while. Overall it’s no doubt a unique and interesting option and certainly a “hands-free” litter box if it does what it’s advertised to do. The Littermaid LM980 Mega is a new and updated model of the popular Littermaid self cleaning litter boxes. It works in a similar fashion to some of the other litter boxes reviewed in this post by the way of a rake sifting the waste into a compartment, keeping the main litter tray free of any waste. The waste is contained in receptacles​ which eliminate odour, however, these do need replacing once full. As a result, there will be an ongoing cost which can add up over time. A common complaint with the Littermaid LM680C is the lack of space the cat has, being a compact unit it does suffer in terms of the space it has some this can make things a litter cramped for larger cats. With the Littermaid LM980 Mega, you get a much larger box providing your cat with enough room to do its “business”. This is undoubtedly a quality product but I feel with the added ongoing costs of the receptacles as well as some users reporting that the motor isn’t the most powerful unit out there, in my opinion, there are better options for this price bracket. PetSafe have two great products in the self cleaning litter marketplace, this is a slightly cheaper alternative to their ScoopFree litter box. As the title of the product suggests it’s “simple” to use in both operation and setup. ​It’s slightly different from the other automatic litter boxes in this post in the way it works and the overall set up. The bowl basically rotates slowly every hour sifting the waste particles from the main litter bowl and they make their way up a conveyor into a contained waste disposal area. ​The waste can simply be emptied by opening the compartment and removing the bag. The most interesting aspect of this litter box is that there isn’t an ongoing need to buy any filters, refills, or boxes of litter. You can use regular clumping litter or crystals and it’s said to reduce the amount of litter you use. ​One of the downsides is that the bowl isn’t the biggest and it’s best suited to cats that weigh less than 15 pounds (6.8kg). ​Some people noted that the motor stopped working after 12 months but was quite an easy fix apparently and you’re back by a 12-month warranty from PetSafe for peace of mind. ​A great cheaper alternative to the other litter boxes on the list, it makes the grade but only just in my opinion. I recently recorded a video discussing the best self cleaning litter boxes for 2019. As with the automatic litter box reviews, I’m going to review the best manual litter boxes or semi-automatic as I think they’re best described. These litter boxes are ideal if you’re on a limited budget but want something more efficient than a traditional litter box and scoop. The Omega Paw litter box is a best seller on many of the popular retail sites, if you’re looking for a great litter box solution but you’re on a budget then look no further than the Omega Paw. ​Being a manual litter box it simply requires you to roll it over when your cat has been to the litter box and this, in turn, moves the clumps of waste into a compartment which then can be emptied. The Litter Spinner Quick Clean Cat Litter Box is a simple but effective design, it’s made from high-quality materials and very secure and sturdy. If you think of this of a manual version of the Litter Robot then you will understand how this works. You basically spin the litter box round which then sifts the clumps of litter into a compartment ready for you to remove. No batteries or electricity is required as with fully automated litter boxes. The benefit of this is you obviously save money on electricity but more importantly, you can move the litter box to your ideal destination without the need for a mains power socket being in a close radius. Overall a great, cheaper, alternative to a fully automatic litter box, however, some users did note that the entrance size wasn’t ideal for large cats, with some struggling to get inside the litter box. Catit Design SmartSift is a unique manual litter box, that basically requires you to pull a lever once per day to sift the litter. ​Once the lever is pulled the litter is then sifted removing any large particles or lumps of litter and storing these in a drawer. Catit state that you only need to empty the draw once per week, which will, of course, save you the hassle. This, of course, will depend on the number of cats you have. ​Built from high-quality materials the Catit Design Smartsift litter box is a great cost effective option. Due to the fact it doesn’t require any electricity or the need to change filters or special litter I feel this product will pay for itself in the long run based on the fact you will use less litter. ​Having a door on the front helps control odour and gives your cat the privacy some cats require when using a litter box. ​A good quality manual litter box, slightly more expensive than the other manual litter boxes reviewed but some will feel this is justified by the ease of operation. A truly semi automatic litter box. As with any product you buy there are certain things you can do to help maximise its effect and effieciency. Below are some pointers to help you get the most from your new self cleaning litter box. Introduction to the new litter box– As we all know cats can be quite stubborn when it comes to their litter boxes or anything in general. It’s important to gradually ease your cat into its new litter box. The way you do this is by having the old litter box at the side of the new automatic one and your cat has the option to use either. In time your cat will start to use the new litter box and will always prefer a “clean” litter box. Use the correct litter– Most self cleaning litter boxes state which is the best litter to use with the box to benefit from hygiene and for the box to operate to its maximum. Maintaining your litter box– Although these litter boxes are automatic it’s good practice to give them a clean to ensure nothing is obstructing any of the moving parts. By doing this you will ensure your litter box is reliable and serves you for many years to come. There are a few products that I use that are brilliant and I feel add value to a self cleaning litter box, these are in my opinion the icing on the cake so to speak. With a self cleaning litter box, you still need to remove the bags from the litter box which in turn creates a bad odour. I found that I would keep the bags either in a small bin or bucket and then empty these a couple of times per week. The problem with this is the smell or cat urine takes over the room and creates a bad odour. This is where these products come in by concealing the smell and waste in a litter disposal system. Both of these products are great at what they do, generally, if you’re in the USA or Canada then the Litter Genie Plus seems to be more popular and if you’re (like me) in the UK the LitterLocker II is the popular product. A automatic litter box, in my opinion, is a great buy and an investment so to speak. If you value your time then it will definitely save you plenty of time and just make life easier in general if you lead a busy lifestyle. The other main benefit I see other than a more hygienic, odourless house is for people who travel a lot for work or pleasure. I recently did a post on Cat Water Fountains and Automatic Cat Feeders and combined with these you really do have a set up where you can leave your cat at home for up to 5 days. Safely knowing they have ample water, food and their litter requirements are taken care of. Of course, it’s good to have a neighbour, friend or family member to stop by and check on your cats if it’s possible, especially if your cat is an only cat. All of the above options are great choices and they will make life easier in general as well as provide your cat with a bit of a “luxury” after all cats love a clean litter box, something that isn’t possible to maintain 100% of the time with a litter tray you need to scoop. Ultimately the decision is yours on which automatic self cleaning litter box fits your budget and serves your needs the best. You won’t regret your decision to purchase one (in my own experience). I hope this post helps you to make an informed buying decision. I’d love to know which litter box you have and your experiences with it, feel free to comment below.